Since 1957, the Myron L® Company has designed and manufactured highly reliable analytical instruments for a wide variety of applications. Thousands of professionals around the world rely every day on the performance of our instruments. Demanding uses range from boiler water testing to ultrapure water control to medical instruments for artificial kidney machines. We are proud of the trust our handheld instruments and monitor/controllers have earned in the past. Our product line has evolved to a new level of outstanding performance and value in analytical instruments: the Ultrameter II series. While priced like affordable single-parameter instruments, the Ultrameter II does the job of three, four or even six instruments. The Myron L® Company FCE function reports FAC quickly and accurately by measuring ORP, the chemical characteristic of chlorine that directly reflects its effectivity, cross referenced with pH. Both DPD kits and colorimeters may tell the user the FAC value of the sample in the test tube, but since the chemistry of that sample is quite different from the source water being analyzed, the results are imprecisely related to actual disinfection power. The Myron L® Company FCE function measures the real, unaltered chemistry of source water, including moment-tomoment changes in that chemistry. Fast and accurate in the laboratory, both Ultrameter II models are rugged enough for daily in-line controller checks in hostile process applications. All calibrations are quickly accomplished by pressing the or keys to agree with our NIST traceable Standard Solution. 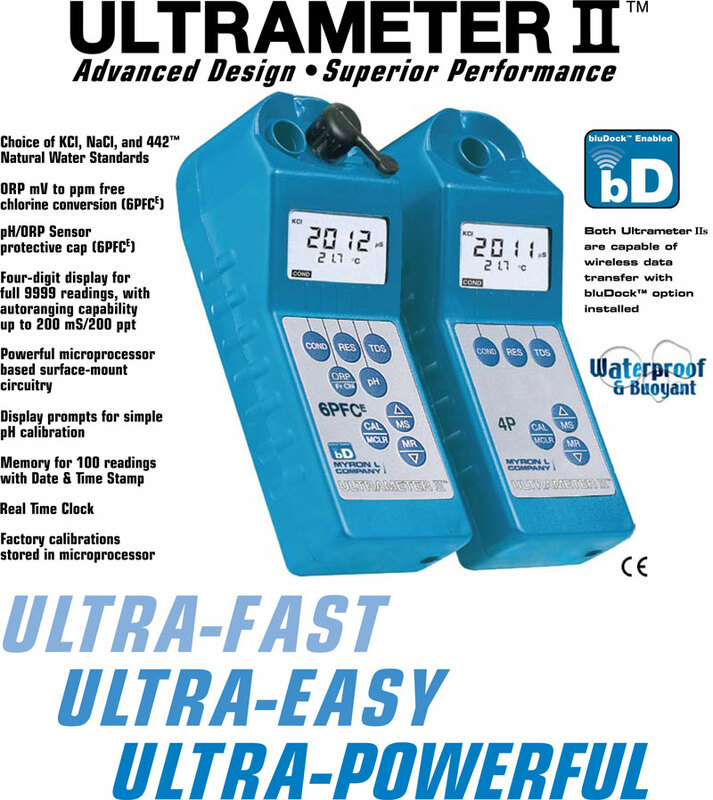 When calibration is necessary, display prompts simplify pH calibration and make sure the correct buffer is being used. Plus, all parameters (excluding factory-set temperature) have an internal electronic setting that can be used for field calibration and as a check on pH/ORP sensor life. User adjustable conductivity/ TDS conversion ratio for greater accuracy when measuring solutions not contained in the microprocessor. bluDock™ Accessory Package includes bluDock™, Macintosh/PC application software for downloading data and printed instructions. Conductivity Standard Solutions are necessary to maintain accuracy and for periodic calibration of conductivity/TDS parameters. All Standard Solutions are NIST traceable for your complete confidence. recommended values: KCl- 7000 (7 mS), 442-3000 (TDS), or NaCl-14.0 (mS) available in 2 oz/59 ml, 1 qt/1 L, and 1 gal/3,8 L.
Available in 2 oz/59 ml, 1 qt/1 L, and 1 gal/3,8 L.
Certificate of NIST traceability for pH Buffer or Conductivity Standard Solutions are available (must be specified when placing solution order). 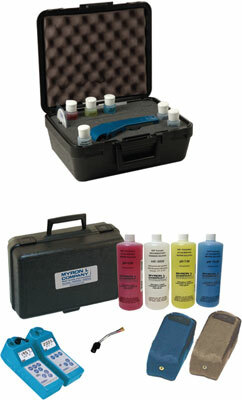 Hard protective case (kit) with three buffers (pH 4, 7, and 10), one pH/ORP storage solution, and two standard solutions, (KCI-7000 and 442-3000). All bottles are 2 oz/59 ml. Soft protective case is constructed of padded Nylon and features a belt clip for hands-free mobility. 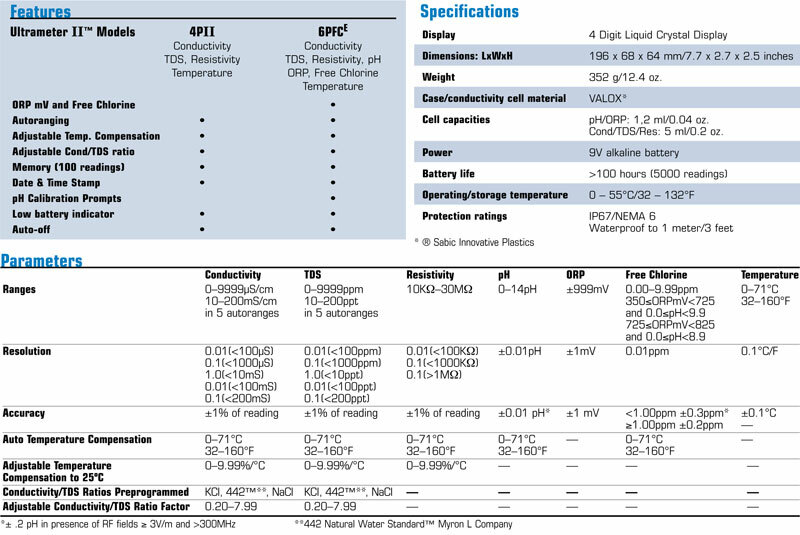 Replacement pH/ORP sensor user-replaceable, features a unique/porous liquid-junction. 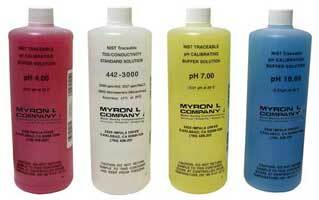 All Myron L® Ultrameter IIs have a Two (2) Year Limited Warranty. 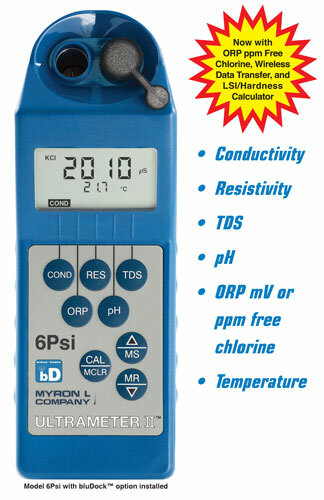 The pH/ORP sensors have a Six (6) Month Limited Warranty. Warranty is limited to the repair or replacement of the Ultrameter II only, at our discretion. Myron L® Company assumes no other responsibility or liability.